I must also mention our sponsors and supporters, to whom we are eternally grateful. Several people sponsored classes at our Show, which paid for the rosettes so lovingly made by our good friend at H&A Rosettes. The Show included Agility and Obedience, and a Heelwork to Music workshop held by our friend Annette Leslie. The Breed Judge was Jackie and the Novelty Judge was our Kyle. A dear friend of the Charity, Alister, was kind enough to judge the Wellidog section and he admitted it was a monumental task. Hilda the winsome lurcher won the Best Wellidog title – so richly deserved. 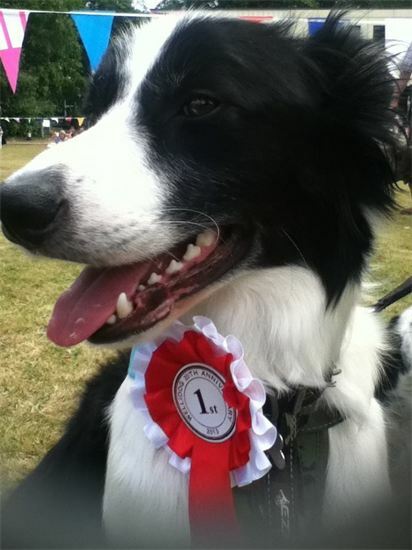 Best Rescue was Archie, a lovely Springer boy owned by our volunteer Shannon. We were all well catered for! Tum Tums provided rolls, hot drinks and yummy cakes [some of which were made by our supporters] and Faith and Geri did a roaring trade with their BBQ. Sometimes it is very hard work running a Rescue Charity but seeing all those current and ex-Wellidogs in the ring [proudly wearing their Wellidog Rosettes and Bandanas] made it so worthwhile. Certainly, all the Trustees were amazed and delighted at the number of people who supported the Anniversary Show and there was a record number of entries. Thank you once again for your continued support for our events and for our Charity. A truly lovely day, certainly one to remember. Paws for thought: ‘If you are meant to have something, it will never pass you by’ – watch this space! We intend to grow in the future, and be in a position to help even more dogs.